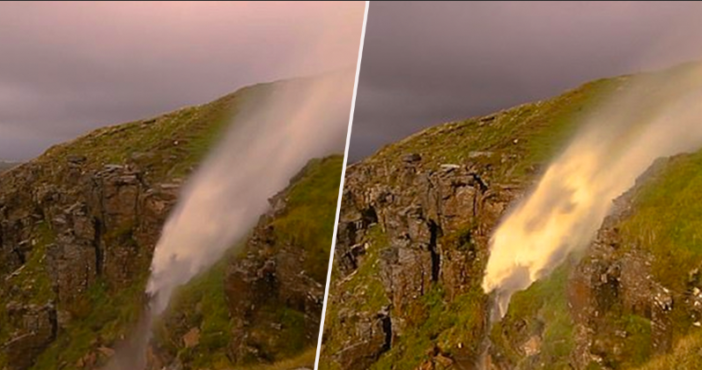 Striking footage taken in Cumbria shows how strong winds generated by Storm Helene were able to ‘reverse’ a waterfall. The gorgeous footage was captured at Mallerstang Edge on September 18, and shows the wind blowing the water upwards; while a rainbow forms inside the waterfall. Although an upside-down waterfall may sound like something from a fantasy landscape, the images of this stunning phenomenon are very real; captured during the peak of the violent storm. US named Storm Helene – which brought 80mph winds to some parts of the UK – has since died down; having left power shortages and traffic disruptions in its wake. Those who have watched the footage have been left mesmerised by the way the water cascades upwards; appearing to defy the everyday laws of nature. Some described it as being ‘unsettlingly satisfying’ while others correctly remarked it was ‘cool as heck’. I’ve never seen anything like that! Hope no one lived there at the top! However, others have been left bamboozled as to what exactly we should call the topsy-turvy waterfall, as the name itself is no longer entirely accurate. Waterrise, perhaps? Waterfall, that’s not how you do that. The instructions are in your name. Waterup? What the hell do we call it now? The Met Office has warned there could be further dramatic weather on the way, as the UK prepares for Storm Ali, the first storm to be named this season. The Met Office has issued an amber ‘be prepared’ alert for parts of Northern Ireland, Scotland and northern England. Storm Ali is already bringing some pretty heavy rain across Northern Ireland and south-west Scotland and is just starting to creep into north-west England. In terms of wind strength, the speeds are coming up, with gusts of just over 60mph in the west of Ireland. Around eight, nine and ten o’clock winds will really start ramping up and go further still. As reported by the BBC, the weather has led two Northern Irish councils to close parks, playgrounds, cemeteries and playing fields, with approximately 55,000 homes and businesses in Ireland left without power. A caravan also blew from a cliff in County Galway, Republic of Ireland. It is believed a woman in her 50s had been inside the caravan at the time. According to the Met Office, ‘Flying debris is likely and could lead to Injuries or danger to life’. The complete list of 2018/2019 storm names is: Ali, Bronagh, Callum, Deirdre, Erik, Freya, Gareth, Hannah, Idris, Jane, Kevin, Lily, Max, Niamh, Oliver, Peggy, Ross, Saoirse, Tristan, Violet and Wyn. Nature truly is amazing and terrifying. I must say, I’ve never seen anything quite like this waterfall before. As Storm Ali prepares to sweep across the UK, stay safe and keep an eye out for other visually spectacular sights.